George Andrew Arthurs, commonly known as “Andrew,” was 23 years old when he became a GOJoven Belize Fellow. 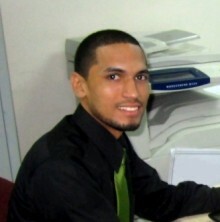 His calling lies in working with youth and contributing to the national response to HIV in Belize. He has served C-NET+, an NGO dedicated to improving the lives of PLHIV, as its Project Coordinator and Monitoring and Evaluation Officer, and he actively participates as a member of the National AIDS Commission/CCM Belmopan Committee. Andrew is a founding member of “Belize Youth Empowerment for Change” (BYEC) and serves as the Treasurer of the Board of Directors. Ultimately, he hopes to create a union of empowered and progressive youth in Belize. Posted in Belize 2012, Cayo District 2012.